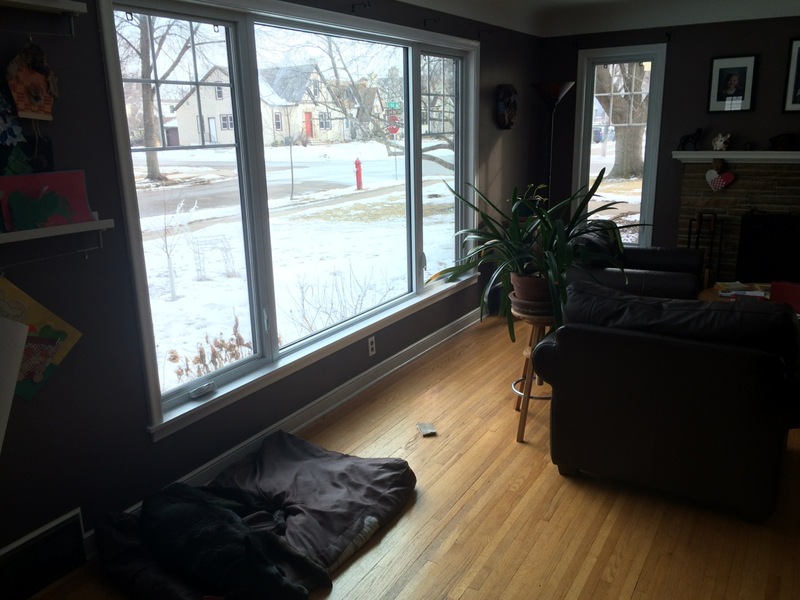 This was supposed to be a triumphant post about how we saved money for three years to install new windows in our house…but… we didn’t quite save enough and we now have a small loan as a result. But oh well, a small loan is better than a huge one! Here’s how we did it. 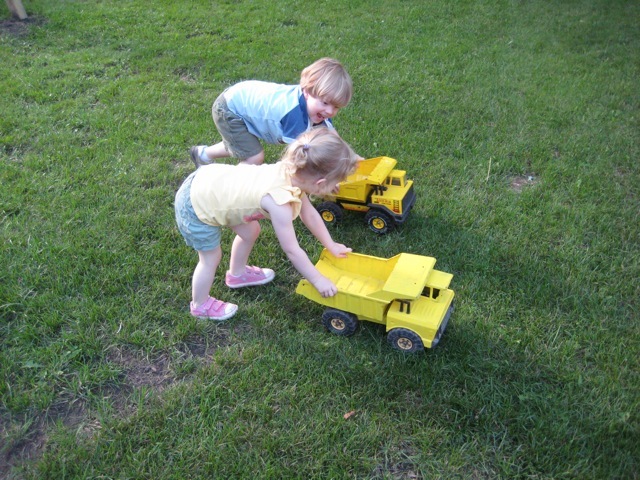 When our twin kids started all-day Kindergarten (free at our school, thank goodness) in the fall of 2012, we immediately started putting every cent that we used to spend on daycare into savings. We were accustomed to living frugally, so it didn’t really feel like much of a sacrifice. Every time our savings account reached $2,000, we paid $1,000 of it towards one of our various debts. In this way, we paid off all our debt in one year. Yes, we were lucky to not have an *extreme* amount of debt. 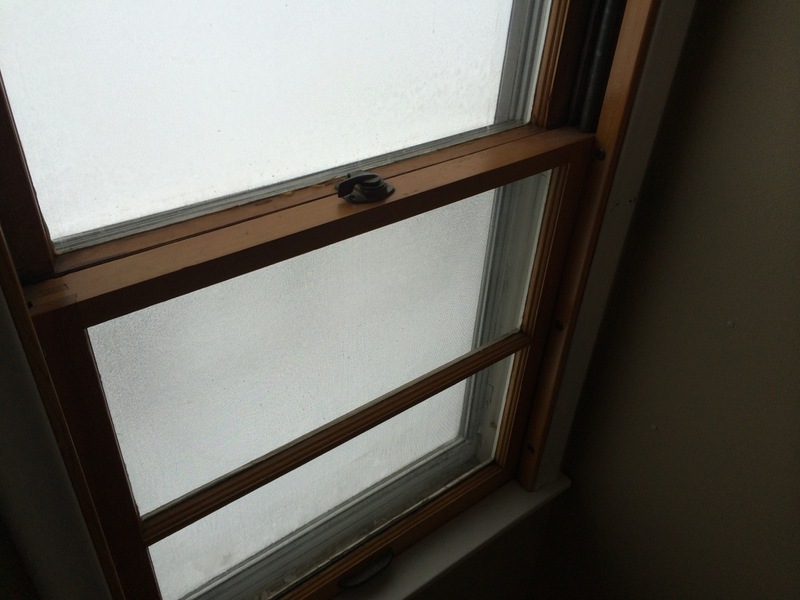 In addition to being completely covered with frost all winter, our windows were also extremely drafty. During the coldest parts of the winter, it sometimes felt like there was a slight breeze inside the house. Most of the storm windows were barely functional, and were difficult to open more than 4-5 inches in the summer, making it hard for us to get good ventilation when we wanted it. So, while we waited to have enough money to actually do this, we started doing some research. We read about energy ratings, learned what fenestration is, and made some decisions about materials. 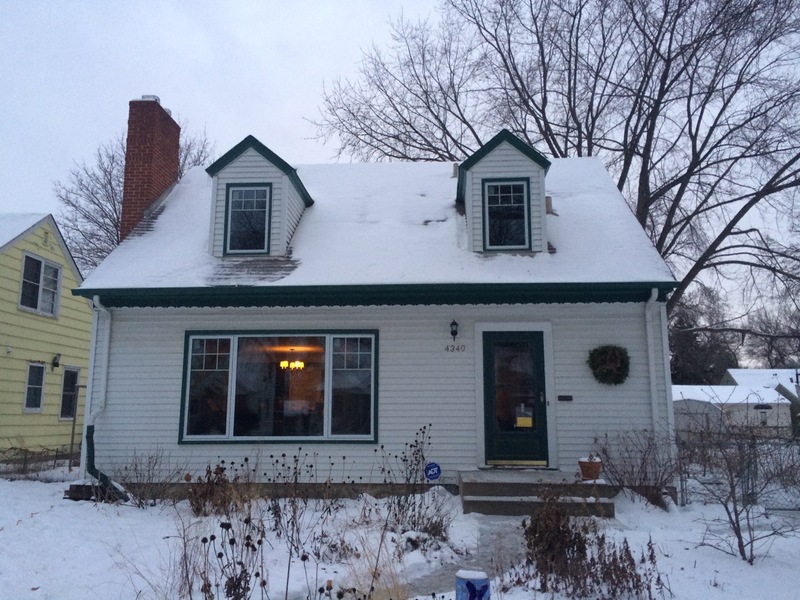 Our goal was to get the most energy-efficient and durable window possible for the price. This three-part series in the Star Tribune was particularly helpful for getting started (part 1, part 2, part 3). 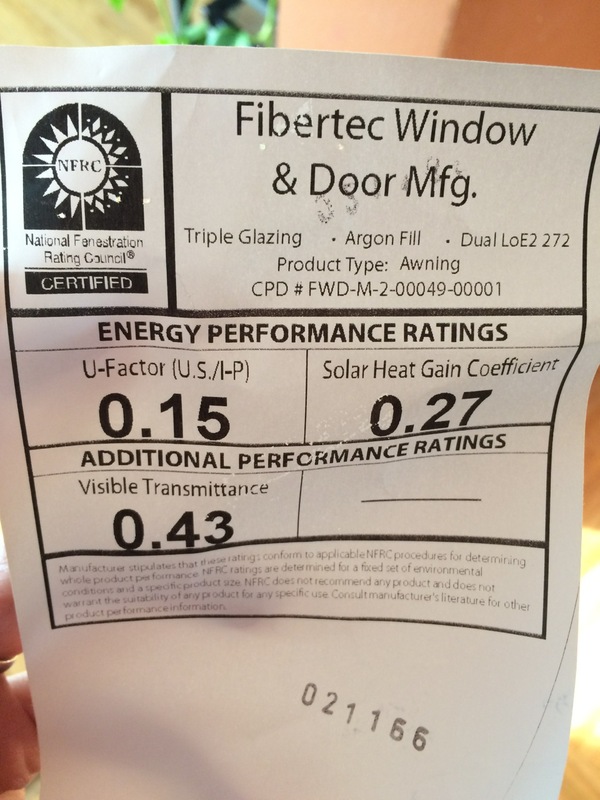 I also spent some time on the Green Building Advisor website, which is where I first heard about triple-glazing, and about the brand we ended up going with, Fibertec windows. I had fiberglass in mind from the very beginning, but we thought we should still get a few different types of bids. Our first bid was from a local builder/remodeler who installed Marvin Infinity windows (double-glazed fiberglass). The sticker shock was a little intense on this bid, which helped us realize that we couldn’t afford to redesign our picture window opening, as we had originally hoped. They seemed like nice windows, though. Our second bid was from a friend of a co-worker, who installs very basic double hung vinyl windows, and the price was half of the bid on the Infinity windows. HALF! But the windows didn’t seem nearly as nice. We decided to get a third and final quote from Above and Beyond Construction, who install Fibertec windows. For what it’s worth, that’s the lowest U-Factor you can get. Now, these are not spectacular as far as solar heat gain goes, and if our house was better-positioned we could factor in solar heat gain. If I was building a new house I would DEFINITELY think about solar heat gain and how we could maximize it both with positioning and glazing of windows. But our house is not positioned to gain any benefit from the sun, here in the inner city, butted up right next to our southerly neighbors’ house. The visible transmittance is also just above the minimum that Green Builders recommended of .40. 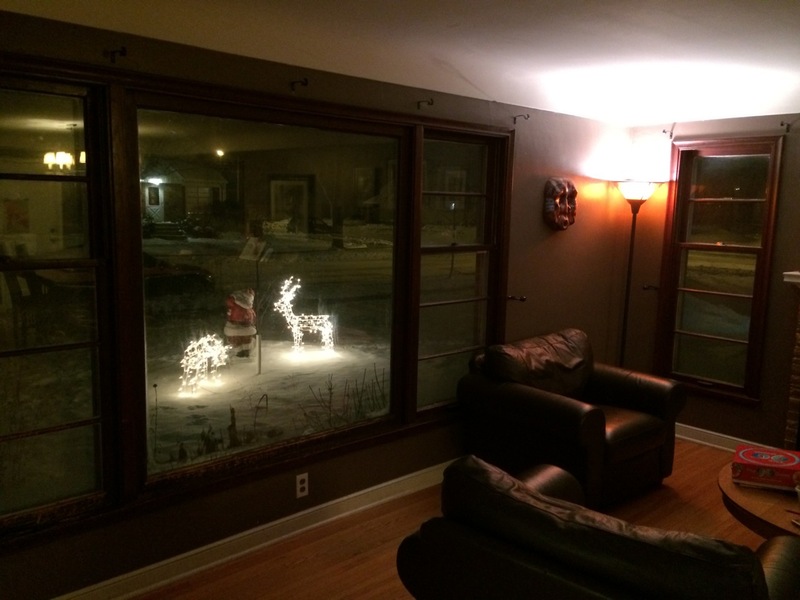 The living room, at night, December 31, 2014. 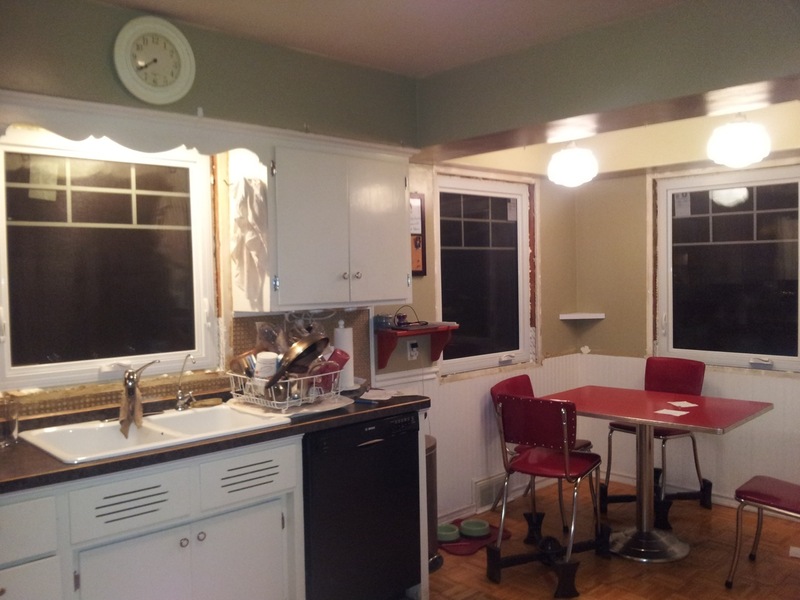 The old double-hung windows letting in their final drafts. Above & Beyond started on New Year’s Day because they needed to time their work with the temperature being above 32 degrees (F). The kitchen, during installation. To shave a little bit of money off the total cost, Adam did all the interior trim work. These are the new windows. 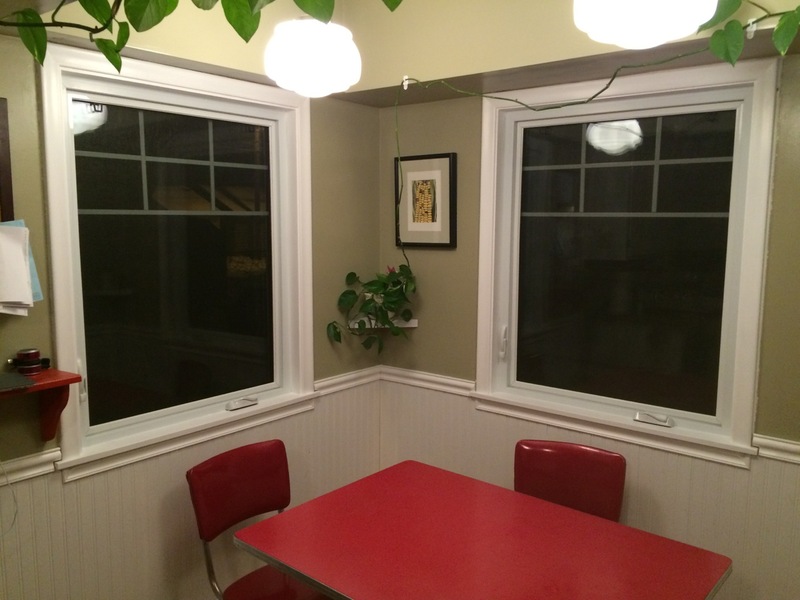 And the breakfast nook with new windows and trim, complete. Nice! We had a very cold snap right away after installation was complete, and we noticed the difference right away. When the temp got down around 0 degrees F and colder, our furnace used to run nearly constantly. Now it was shutting off and staying off for many minutes before cycling back on again. Our three doors are still very old and drafty, so if we can save up and replace those, we will really start hitting new highs with efficiency. An after view of the living room. Triple-glazed windows are supposed to be harder to see out of than double-glazed. I’ve not noticed a difference except occasionally at night, when trying to look at the moon at an angle, there is a definite triple reflection. They are also harder to see into, and we have already had several birds fly into them–so far all of them survived the collision though, thank goodness. 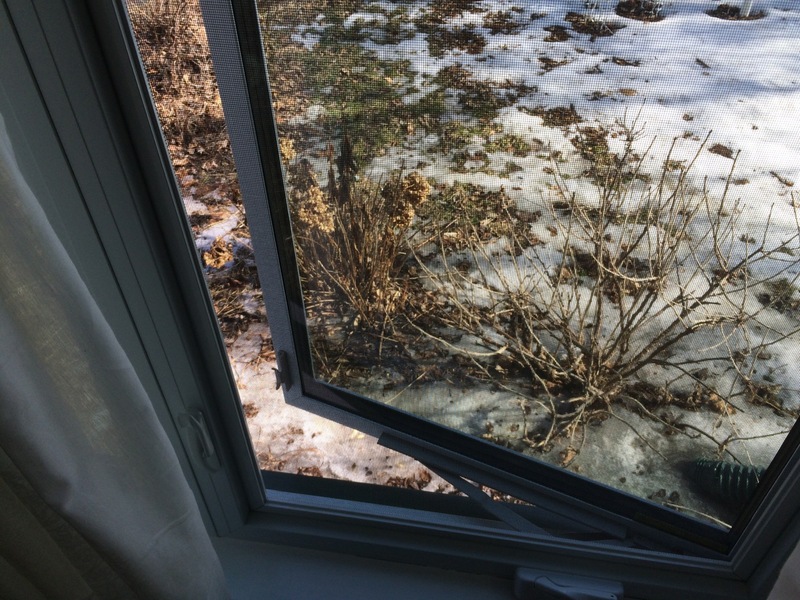 What, you don’t open your windows when there’s still snow on the ground? As you can see this is a casement-style window, which means you crank it open. We chose these over double-hung (where you lift the sash to open the window) for the simple reason that casements are more energy-efficient–you get a better seal when you don’t have all those moving parts. These also have a much bigger glass surface area than our old windows, and certainly bigger than the vinyl windows that we got a bid for. We decided to go with the square pattern on top to complement the cape cod style of our house. Cute, yes? For the middle of winter, anyway. We were a little nervous about tampering with the period style of our house–houses from the 1950s really ought to have double hung windows, but we hoped the square pattern would alleviate that a bit. So there you have it: the new windows process, which seemed VERY LONG at times (especially during the three years of financial preparation). So far, though, no regrets. We’ll have them paid for by mid-summer as long as everything goes according to plan. A 6-month loan is better than a 3-year loan. At this point, I would have to say that I recommend both Fibertec and Above and Beyond Construction. Questions? I’ll probably forget everything about this process within a few months, so best ask me now. I had already forgotten the names of the two other companies we got bids from! Thanks for reading, as always. Categories: Architecture, Practical, Sustainability, Theoretical, Water/energy efficiency | Tags: double hung windows, green technology, solar heat gain | Permalink. 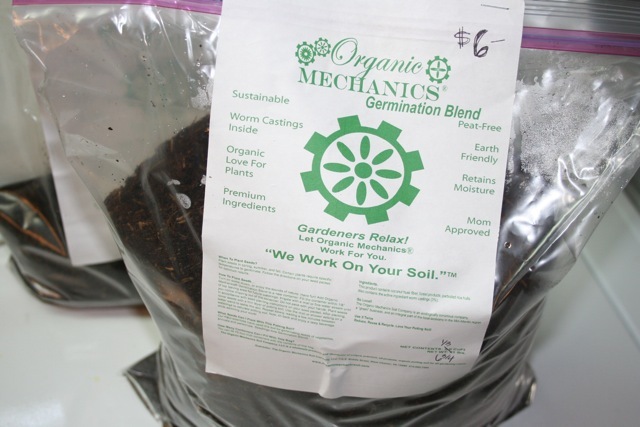 If you’ve done any gardening, you’ve likely read that peat moss is a great soil amendment. It is. However, peat moss is–surprise!–not a great choice if you consider the source. Peat bogs are fragile ecosystems that sequester a lot of carbon from the atmosphere, and, like other swamps and watershed areas, help purify run-off water before it can get into our streams and rivers. Now, the Canadian Sphagnum Peat Moss Growers association will tell you that peat bogs can, in fact, be restored. I hope that’s true, but I’m trying to move toward using byproducts instead of, well, products. It contains coconut husk fiber, “forest products,” parboiled rice hulls, and worm castings. It has a real nice texture and the added bonus of not puffing up all weirdly like the peat-based seed-starting mixes do when you add water. Now, neither coconut husk fiber nor rice hulls are exactly a local product for me here in Minnesota. (Neither is peat.) But they are byproducts, so that’s an improvement. Will they work? I’ll let you know. I’m keeping my seed starting modest again this year, with just one flat on top of the refrigerator under my JumpStart light system. 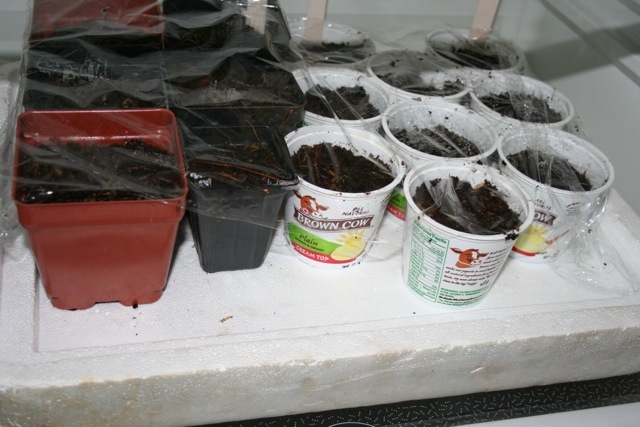 The plantable pots are also made of coconut husk fiber, also called “Coconut Coir.” I plan to buy several peppers and tomato plants at the Friends School Plant sale; they always have a good variety of heirlooms. Now that my pickle fridge is almost empty (boo!) 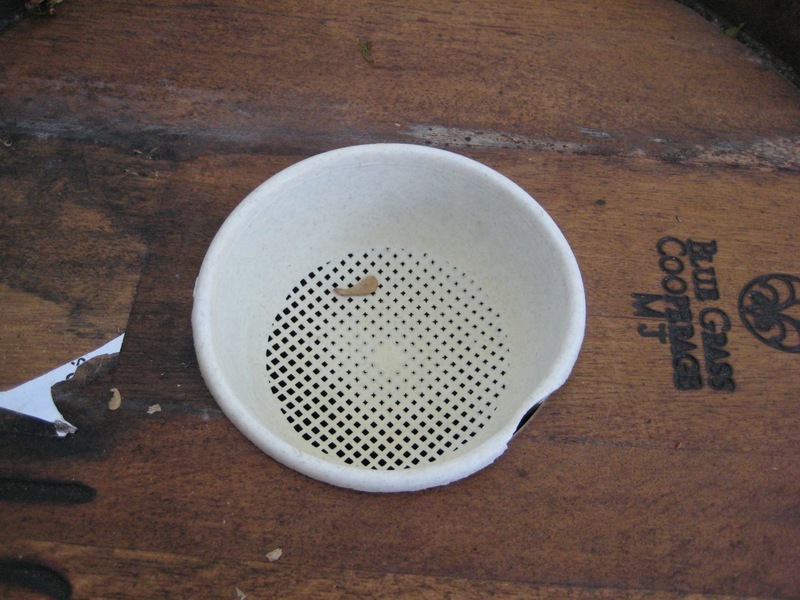 I have another flat of recycled plant and yogurt containers chilling out in there. 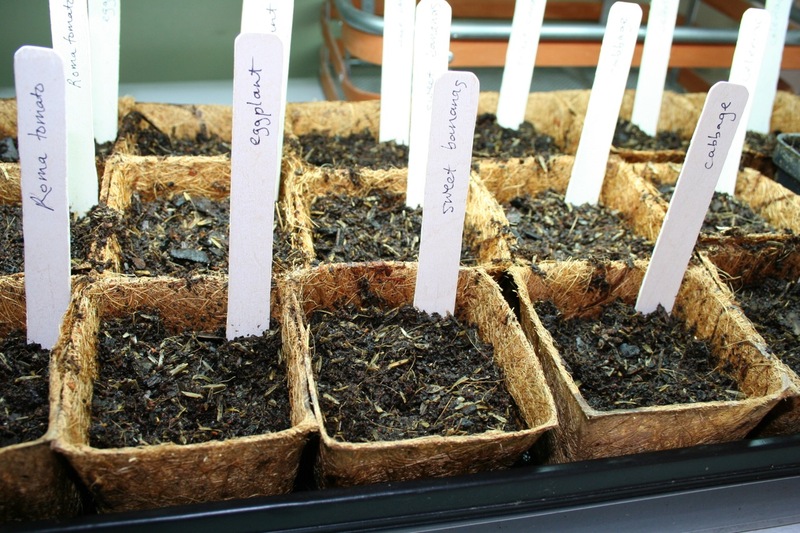 I plan to convert my boulevard to all native prairie plants this year, so I’m starting some of those seeds, too. Here I have 5 each of Prairie Blazing Star, Butterflyweed, and Little Bluestem. Chilling seeds like this is called stratification — it fools the seeds into thinking they were lying under snow all winter. Planting fever is upon me! Categories: Gardening, Practical, Sustainability, Theoretical | Tags: green technology | Permalink. A few weeks ago, I took a mid-summer Master Gardener refresher course at the Minnesota Landscape Arboretum. Bob Mugaas, the awesome turf-grass guy from the U of M, gave a presentation about new no-mow landscape grasses that the university is developing. Some are already available commercially. The implications of this are incredible. Imagine not having to mow your lawn. Imagine all the oil and emissions that could be saved if people mowed their lawns only 2-3 times a summer at the most. For us, our yard is so small, and we use a reel-type mower, so it wouldn’t be a huge savings in time or money. But if I had a huge suburban yard, I’d be all over this. The main no- and low-mow turfgrasses that are available commercially today are fine fescues, such as red fescue, chewings fescue, and hard fescue. These can look a little floppy — because of their finer grain they don’t stand straight up like ye olde Kentucky bluegrass. So adjust your expectations, yo. Here’s an article from Extension with much more information as well as resources on where you can order low- and no-mow grass seed mixes. Alas, I think you’d most likely not be able to find sod, because this is all still too new. 1) The best time to seed and the best time to fertilize are both in the early fall. 2) When watering, think deep & infrequent during the spring and fall, and more frequently but not so deeply in the summer. This is because the root systems of grass plants typically die back quite a bit during hot, dry weather, but grow deeper during cool weather. 3) Setting your mower an inch or two higher will result in cooler, happier root systems and healthier grass. If you are trying to achieve a putting green for a yard, your mower is set WAY too low. Categories: Community planning, Gardening, Permaculture, Practical, Sustainability, Theoretical, Water/energy efficiency | Tags: green technology, Permaculture, U of M Extension Service | Permalink. I like that this one is made with better components than our plastic ones — the cheap hose attachments on our plastic ones are already falling apart. 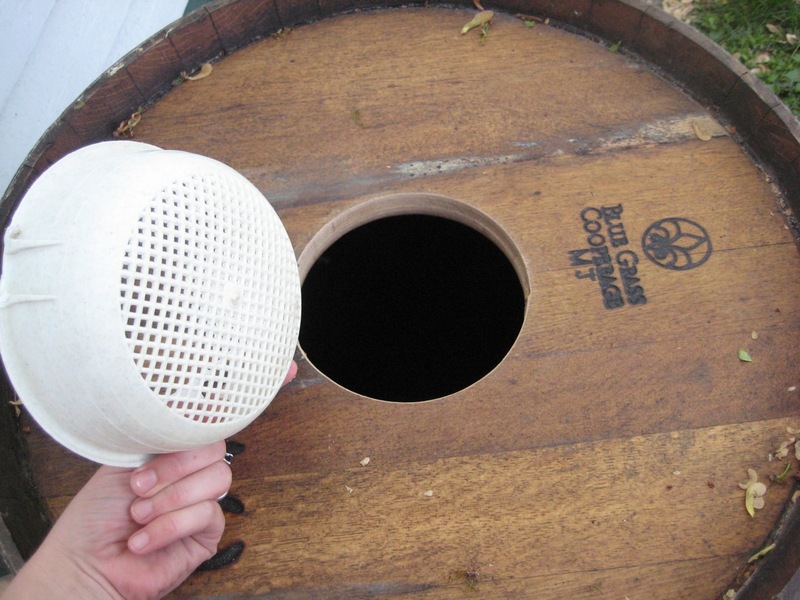 The only challenges with it were: 1) it is extremely heavy, 2) we needed to find our own screen for the top, and 3) there was a 2″ hole in the middle which Adam had to cut a piece of oak and plug (visible in picture). Perfect. Now we just need some rain. 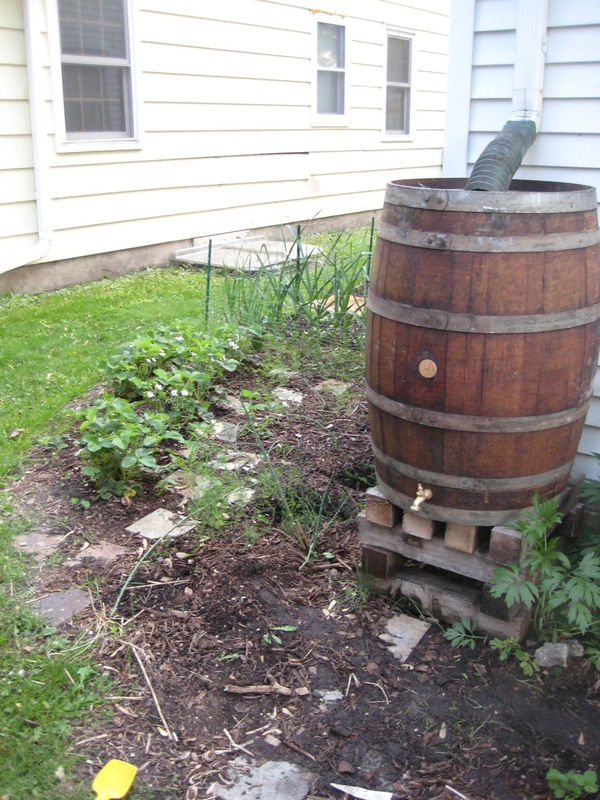 Categories: Gardening, Practical, Water/energy efficiency | Tags: green technology, rain barrels | Permalink. Europeans are doing some neat-o, green redevelopment — from the no-car Vauban district in Frieburg, Germany (which I’ve mentioned here before) to well-planned urban public spaces in Copenhagen — there is some cool stuff going on there. Read all about it here. And then see what you can do in your own community. the essential first step, maybe the only critical one, in reassembling these shards and building the urban foundation of the Green Enlightenment is to put people ahead of their cars and public spaces ahead of private ones in the planning priorities of the city — of any city. Categories: Architecture, Community planning, Sustainability, Theoretical | Tags: bike commuting, green technology | Permalink. And one of the ten is give them raw milk! Alas that I have no access to it. Does anyone know a source of raw milk in the Twin Cities metro area? The rest of the nine “truths” are mostly very simple ones, such as: kids will eventually eat their vegetables — if they see you eating your vegetables. The full report is a pdf; click here to download it. Here’s the rest. One of the things I love about glass is how endlessly and easily recyclable it is (unlike plastic). I’m sure there’s a horrible downside to this that I’m not thinking of, though? Categories: Gardening, Nutrition, Practical, Sustainability | Tags: green technology, parenting, raw milk | Permalink.